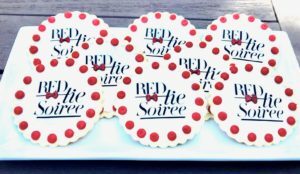 October 21, 2018 – LA Kelley Communications, Inc.
Well I’m ready for a rest! 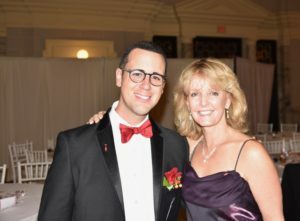 Last week I was in Orlando at NHF’s 70th annual meeting, and last night, at the New England Hemophilia Association’s Red Tie Soiree in Worcester, Massachusetts. And while there is so much happening with new products, with gene therapy coming closer, new programs for our community, and the spectacular movie Bombardier Blood ready for viewing nationwide, the overriding feeling I have after these major events is… this is family. We are truly a family, united by blood. As I’ve been in the community for over 30 years now, I’ve come to know so many people, and have watched as babies have grown to young adults, starting families of their own, some also with bleeding disorders. Our family grows, and grows older! 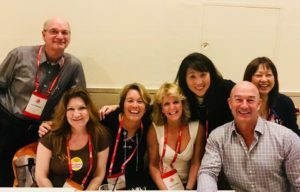 My friends and I, all young moms and dads when we came into this family, are now in our 60s, looking back at the incredible path this bleeding disorder family has traveled together. One path literally is the one that led to the movie Bombardier Blood, which debuted last Saturday in Orlando. 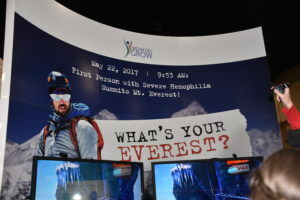 To a standing room only crowd of over 500 people at 7:15 am, the Octapharma-sponsored event and movie about Chris Bombardier’s epic Everest summit brought laughter and tears to all. It is a stunning film, directed by Patrick James Lynch—whose name you all should know as well as Chris’s by now! These two young men with hemophilia have skyrocketed to fame with their achievement. It makes us, the older moms and dads, incredibly proud. We all kind of feel like they are “our” sons, or like our sons. Sons of our community, doing daring things for our community. Go Here to See Photos from NHF’s 70th Annual Meeting! I was honored and fortunate to travel the actual path to Everest base camp with Chris and his wife Jess, and share in part of that historic journey. All the while, I felt like the mother I am, watching out over both of them (as if Chris needed it!). Viewing the movie that morning brought back so many memories and feelings of that journey in May 2017. 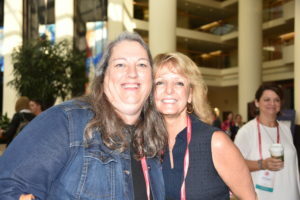 So much of the NHF meeting was connecting, with old friends and new, with families in need and families who can share and give. And at the final night we listened to music and danced the night away. While blood unites us as family, music unites us in joy. Anaheim, Orlando, San Diego. You’ll never see one in Boston—too expensive. Not everyone can afford to go away by air and stay at hotels. While there are scholarships for first-time families, it sadly still leaves many in our family on the fringe. Laurie Kelley with Kevin Shaughnessy, who she met when he was 12! And that’s why we have local chapters and state bleeding disorder organizations. Does your state or region have one? The New England Hemophilia Association has become one of the best run organizations in the US. It wasn’t always that way. As we heard last night, when Charlie Dougherty, who served as treasurer and who passed away earlier this year, found when he joined, it was poorly run and $22,000 in the red. He straightened it up, but it took Rich Pezzillo, a young man with hemophilia, to rocket it into the highest level, and not just by squaring away financials. Rich has breathed new life into NEHA, infusing it with passion and commitment like never before. I confess I never donated to NEHA, even though I’ve lived in New England all my life. But with Rich’s leadership and his crackerjack team, we are all excited to give and participate once again. Last night proved it. I sponsored three tables and invited the team at Save One Life to come and experience the joy of this family reunion, and they had a blast, amazed by the comradery and caring. In many ways, I find I can enjoy our bleeding disorder family simply by being local. So there’s hope for you too, to join this family by seeking out your local organization. Is it active? Does it have programs? NEHA has programs every month, sometimes every weekend! Does your chapter do a fundraising walk? Have a women’s or teen program? Is the re someone to call to learn how to get involved? I would really urge you to do everything you can to participate. Bleeding disorders can throw a curve ball at you at any time, as life can too. This family, this “Wicked Strong Family” as we say in Boston, is here to help. These friends have become more than friends—they are truly family. And when I attended the wake last Friday of my first cousin’s husband, who died unexpectedly at only age 61, you realize how family is always family, no matter what. I visited with my cousins, who I rarely see anymore, except on Facebook. We were playmates as children, but life gets busy, the family gets bigger and reunions consist mostly of funerals now. Still, we have history and we are united by blood. It was good to see everyone again; I still love them all. See Photos from NHF’s 70th Annual Meeting here! We’ve lost a lot of people in this community this year and as life goes on will continue to lose more. It’s at this time that family comes together: whether nationally, or locally. Find out more about your local chapter; meet your hemophilia/bleeding disorder family. Get involved; give of your time or support. We are all united by blood, and can create the family we need by connecting, caring, sharing and loving. And a little celebrating and dancing doesn’t hurt either!